Growing up dyeing Easter eggs was a favorite activity that I looked forward to every year. 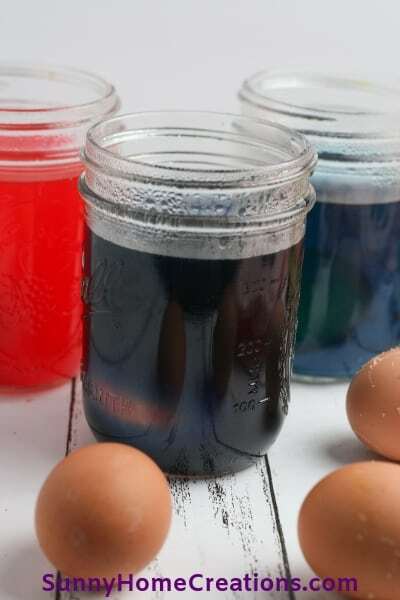 Sometimes we’d buy the egg dye kits at the store and other times we liked dyeing eggs with food coloring. One thing we’d always do is draw on our eggs with a wax crayon. Most often my sisters and I were the ones dyeing the eggs. My older sister would get everything prepped out for us while my younger sister and I would start trying to decide what to draw on our eggs. We would draw everything from simple flowers (my personal favorite) and shapes like polka dots to wacky designs. Sometimes we’d dye our eggs first, then draw our designs on with the wax crayon and dye them again. Our only limitation was our imagination. 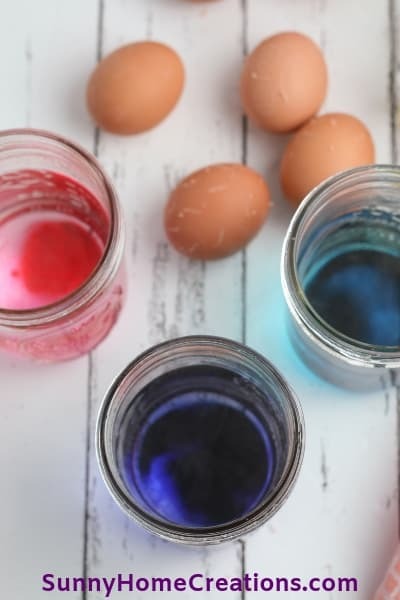 To make the dye with food coloring you are going to boil some water (I normally use about a quart of water and boil several batches depending on how many different colors we plant to use). 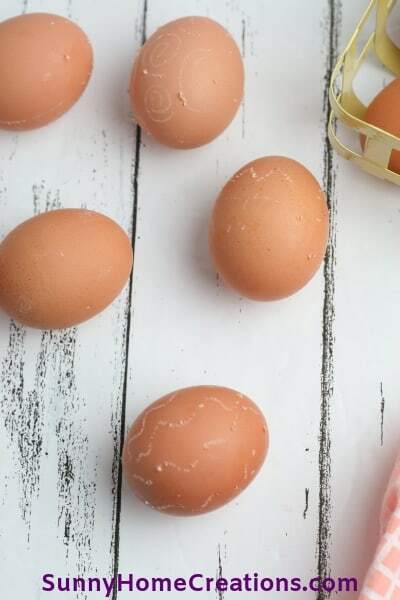 Now you need to decide if you want to have the white or brown color of the egg show through for your design or if you want to dye your eggs and then have those dyed colors show through as your designs by dyeing them again. 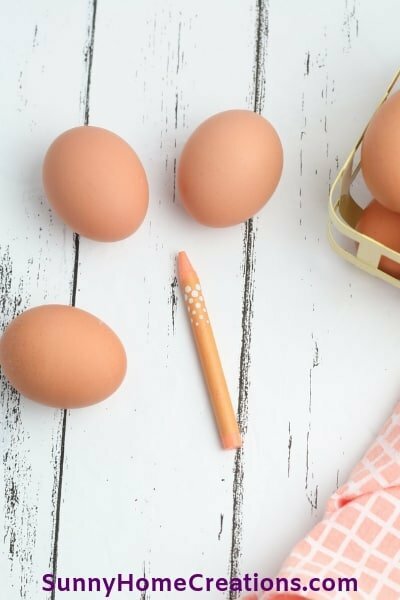 If you want your egg’s natural color to show through, then use the wax crayon to draw designs on the sides of your eggs. 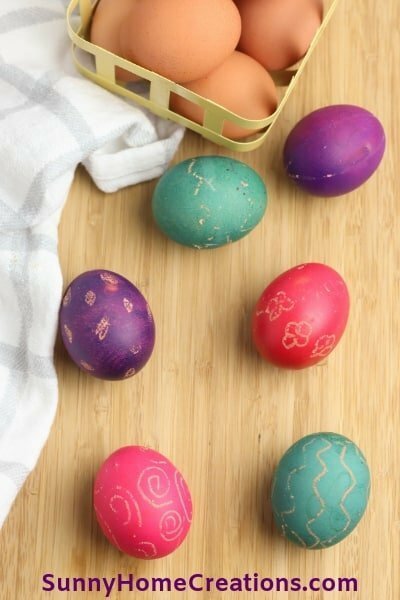 Place an egg into one of the cups of dye. Depending on how dark you want the dye will depend on how long you soak the eggs. If you just want a very pale color on your eggs, you can even just dunk the egg in and call it good. Otherwise, it’s more likely you want to have the eggs soak for about 10 minutes in the food dye solution. Take your egg out and let your eggs dry. We use egg carton to place our eggs into while they dry. 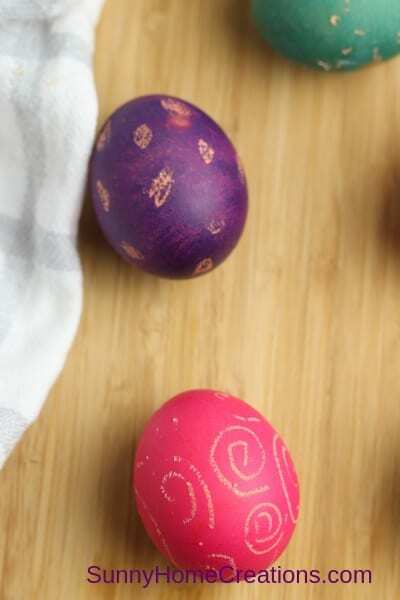 If you want to have the dye showing through your design, then you will now draw your design on your egg that has been dyed and dried. Then place your egg in the next cup of dye to soak. If you decide to do the double dyeing, you will find that you may need to experiment. You will want to dye a lighter color first, then after drawing with the wax crayon use a darker color as the final color. If you use a darker color first, the lighter color won’t show up. Good luck and have fun dyeing eggs with food coloring! Previous Post: « Best KitchenAid Mixer Attachments You Can’t Live Without!